Welcome to POST Wrestling’s coverage of the first New Beginning in Sapporo card from Saturday. Kevin Kelly and Don Callis are on commentary for New Japan World. This is part of Kitamura’s seven-match trial series. Kitamura landed his huge chops but was hit with a bridging German and kicked out. They had a long battle for a vertical suplex and it was Kitamura executing the suplex. Callis said there used to be guys like Ted Arcidi and Bill Kazmaier, who looked like Elgin but couldn’t wrestle like Elgin. Kitamura hit a tackle and fired up, Elgin came and killed him with two lariats. Elgin hit a buckle bomb and followed with an Elgin bomb for the win. This was exactly what this match needed to be, focusing on Kitamura’s developments, emphasizing the improvements and ultimately falling to the established Elgin. Don Callis was very effective by stating that Kitamura would have lost in 3-minutes if this match was six-months ago and lasted longer tonight. The announcers heavily promoted tickets going on sale Monday for the Long Beach, California card on March 25th. Manabu Nakanishi took the spot of Satoshi Kojima, who tore his ACL earlier in the week. There was a brawl on the floor led by Iizuka and Taichi used the bell hammer on Liger inside the ring. Iizuka bit the foot of Liger, who responded with a shotei and made the hot tag to Tenzan. Tenzan used the Mongolian chops on Iizuka. Nakanishi was in with a double vertical suplex spot to Kanemaru and Desperado and the crowd into the big power spot. Liger landed a somersault off the apron to Taichi on the floor. Kanemaru missed KUSHIDA and spat whiskey into the face of Taichi. KUSHIDA was left with Michinoku and submitted him with the Hoverboard Lock. Better than your typical Suzuki-gun multi-man tag match. This was fast-paced, the crowd was into the key spots and they all worked at a fast clip to keep the audience engaged. Callis joked they may have a four-man booth in Long Beach and joked about Kelly having heat with Josh Barnett. Owens was tagged in and insisted that Yano tag in, so Ishii tagged Yano in. Ishii blocked a package piledriver by Owens, Yujiro stopped Yano from hitting a low blow and then Owens missed Yano and took out his partner. Ishii was left with Owens and hits the brainbuster for the win. This was a run-of-the-mill tag bout. Ishii doesn’t have a lot going on and is just playing a role on the backburner. I would expect him to have a strong presence for the New Japan Cup. Taguchi is wearing the captain’s armband. Fale took Makabe into the audience and choked with a cable. The Bullet Club members beat down on Henare for the heat. Makabe was eventually tagged in with Fale with the two big men of the respective teams going at it. Henare hit a flying shoulder block to Tonga for a near fall. Makabe and Henare did the running clotheslines into the corner as Taguchi waved them on, Taguchi landed a reverse hip attack and Henare hit a spear with Fale making the save for Tonga. Tonga recovered and was alone with Henare, he introduced a new submission with a half-nelson crossface and Henare tapped to the new submission. Yes, a successful defense of the six-man tag titles, it truly is a “New Beginning”. Cody still has a notable black eye from a spot with Matt Taven at the ROH tapings last weekend in Nashville. Cody stomped the right ankle of Robinson in their corner. Robinson was being beaten until landing a double knee gutbuster to Scurll and the crowd rallied behind Robinson. Cody and Ibushi were tagged in and the people were buzzing for the two. Ibushi landed on the knees of Cody for a standing moonsault, recovered and hit a standing corkscrew successfully. Scurll stomped the elbow of Robinson and Robinson rolled to the floor. Scurll lifted Ibushi onto his shoulders, Cody hit a springboard missile dropkick and Ibushi landed on his feet. Scurll grabbed Ibushi and Cody missed with the Beautiful Disaster and nailed Scurll. Page and Finlay entered the match and Page won with the Rites of Passage. Good match and Ibushi had a very good performance in this quick six-man tag. The audience seemed into Ibushi and Cody a lot with Ibushi continuing to feel like a top-tier babyface to the audience. Cody told Ibushi that “it’s not done” between them after the match. Naito spat towards Callis before the match as a message for Chris Jericho. They immediately started on the floor with Naito attacking Yoshi-Hashi with his stick. The match slowly built to Ospreay and Takahashi being tagged in. Ospreay landed a 619 but then had his knee dropkicked out from under him by Takahashi. Ospreay hit a running baseball slide dropkick into the corner and followed with an incredible standing Phoenix splash. Naito was in and attempted a top rope huracanrana with Ospreay landing on his feet. Ospreay hit the Robinson special, the referee was distracted as Naito pressed Ospreay into the air and Takahashi landed a low kick to the groin as Ospreay came down. Naito used a jackknife cover and pinned Ospreay following the low blow. Will Ospreay was the standout in this match and his singles with Hiromu Takahashi is going to be incredible in Osaka. Naito feels very strong and protected coming off the loss to Kazuchika Okada and priming him for the big match with Chris Jericho. If it was my call, I would hold off that match until Dominion. Yoshi-Hashi attacked Naito in the aisle after the match and will have their singles match in Osaka as well. Okada and Sanada began the match and the audience was chanting for Okada. Okada’s pants are here to stay, but one-upping him was Sanada, who had new gear (approved by WH Park). Goto and EVIL fought into the crowd while Sanada and Okada fought on the aisle. This left Bushi with Gedo inside the ring. Sanada went for the Skull End to Okada and Okada countered out of it. LIJ triple-teamed Okada, ending with a back cracker from Bushi for a two-count. Bushi went for the MX and Okada ducked. Okada and Goto did a cool tandem spot with Okada delivering a Death Valley driver while Goto hit the Ushigorosihi. Okada then applied the cobra clutch hold and submitted Gedo. Okada addressed Sanada after the match and said he won’t let go of him when he applies his cobra clutch. Sanada returned to the ring but didn’t say anything and walked off to the back. Okada charged after Sanada and attacked him. He sent Sanada into the ring post and hit a tombstone. He had a bag of “Okada bucks” and stuffed them into his mouth and applied the cobra clutch like he was Ted DiBiase. The announcers stated that Okada humiliated Sanada. 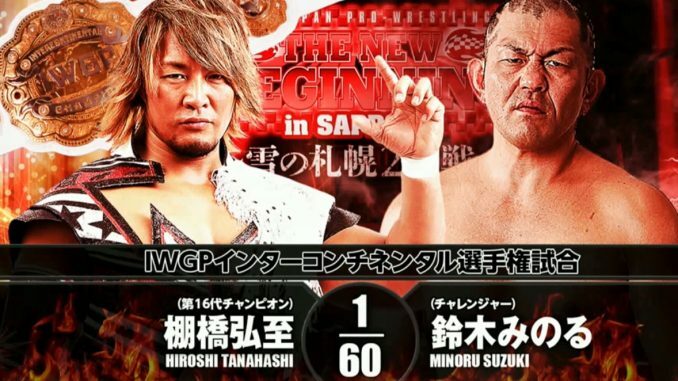 New Japan is not this stupid with booking decisions and I imagine there is a major revenge angle coming because, on its own, this left Sanada worse off than before. Omega hit snap Dragon suplexes to both Sho and Yoh. Jay White came in and he took one as well from Omega. Omega and the Bucks hit a triple superkick to Sho. Nick dove onto Yoh and White on the floor and landed on his feet upon execution of the dive. Nick hit a Swanton onto a draping Sho on the middle rope for a two-count. Nick then applied a sharpshooter to Sho while Nick and Omega held his partners on the floor, White broke free and stopped the hold. Sho and Yoh made a comeback with a back cracker to Matt into a flying knee from Yoh. Omega entered and went for the One-Winged Angel to Sho, White stopped it and attempted the Blade Runner to Omega but the Bucks stopped him. Matt lifted Yoh into the tombstone position and Omega pressed Nick in the air for an Indie Taker and Omega pinned Yoh. White attacked Omega from behind and hit him with the Blade Runner while The Bucks were busy posing to the audience. Nothing on the show has been “excellent” but it’s accomplishing the purpose of promoting the big matches for the remaining New Beginning shows. This was a good match and better than most of the matches on the show so far. The post-match angles have been more noteworthy than the actual bell-to-bell content. The video package for this main event was tremendous. It went through Tanahashi saving the Intercontinental title from Tetsuya Naito, who was going to retire it, going through Tanahashi’s title defenses, Suzuki losing his hair and becoming a madman and the knee injury Tanahashi has been working with. The maniacal laugh by Suzuki at the end of this video was incredible. Suzuki came down to the ring with Taichi, Yoshinobu Kanemaru, El Desperado, and Taka Michinoku. Suzuki’s hair is beginning to grow back. Suzuki is targeting the knee early as they find themselves in 50/50 guard and Suzuki went for a kneebar. Suzuki then applies the armbar in the ropes to the injured biceps of Tanahashi. Suzuki attacked him with a chair on the floor. Tanahashi mounted a comeback and he attacked the right knee of Suzuki with different variations of the dragon screw leg whip. He applied the cloverleaf and Suzuki uses his head to move himself to the rope for the break. Suzuki landed his killer dropkick right to the face of Tanahashi. Tanahashi hit three straight Twist and Shouts while keeping his grip applied. He landed a sling blade and ascended to the top, landed a standing High Fly Flow and landed on his right knee and immediately grabbed the knee in pain and couldn’t cover Suzuki. Tanahashi staggers back to the top and goes for the High Fly Flow again, Suzuki gets his knees up and locks on a kneebar to the back knee of Tanahashi. Suzuki is torquing on the knee with everything he has and Tanahashi is screaming in agony. Tanahashi gets to the bottom rope. Suzuki rolls him to the center of the ring, Tanahashi finally rolls back to the rope and Suzuki holds on until the count ends by Red Shoes. Tanahashi applies a cloverleaf and Suzuki escapes by applying a cradle for a two-count. Tanahashi kicks out and immediately hits the sling blade. Tanahashi cannot run the ropes as his knee fails and Suzuki dropkicks the injured knee as he smells blood. He re-applies the knee bar onto Tanahashi with a figure-four on the right leg applied. Tanahashi again makes his way to the rope. Suzuki lands the Gotch piledriver and then re-applies the knee bar instead of going for the pin. Tanahashi is screaming in pain. Red Shoes is pleading for Tanahashi to give up, but he won’t. Suzuki releases the hold and re-applies, torquing the knee further and Red Shoes stops the match. This main event was excellent and told a phenomenal story. This should lead to Tanahashi taking time off and Suzuki more dangerous than ever with the championship. They emphasized that Tanahashi never submitted and Red Shoes stopped the match for Tanahashi’s well being. As a whole, this card was all built around the main event and the match delivered huge. The undercard was a fine Korakuen Hall show. The main event is the match to watch.